The book includes chapters on the nature and possible causes of ADHD as well as chapters on various treatment modalities and on long-term prospects and adults with ADHD. Each chapter includes summary lists that highlight the main points made in the chapter. In addition, a good annotated resource list is included in one of several appendixes. Overall, the book is well written and provides a considerable amount of information in a relatively small number of pages and would serve as a good reference for anyone who wants a concise overview of the medical aspects of this disability. '- Disability Studies Quarterly'The AD/HD Handbook by Alison Munden and Jon Arcelus, is a concisely written, well-organised book which leads the reader step-by-step through the recognition, diagnosis and treatment of AD/HD. The chapters are well organised and contain useful checklists of core symptoms, associated disorders, assessment methods, treatment team members and other useful information. For the professional there is a list of useful assessment instruments, and the books and videos in the appendix are accompanied by short descriptions that will aid readers in their selection. There is also an extensive list of web-sites for those that are new to this technology. '- Young Minds'It provides a concise, well-organised review of the field which reflects the practice of many contemporary child psychiatrists. '- Psychoanalytic PsychotherapyThe ADHD Handbook provides a comprehensive account of current knowledge of ADHD and offers practical advice to parents, teachers, social workers and other professionals working with young people and their families. The authors also look at the long-term prospects for children with ADHD and the difficulties they may face. A chapter on ADHD in adults is included, as there is a growing body of evidence to suggest that ADHD can affect people of all ages. The book will act as a signpost to all those trying to address the difficulties faced by young people with ADHD, directing them to appropriate sources of help. 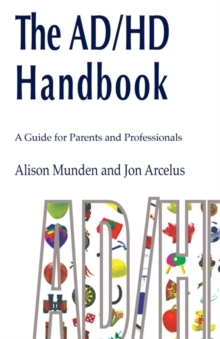 Focusing on the provision of practical help and a clear approach, The ADHD Handbook is the ideal introduction for parents and professionals. Attention Deficit Hyperactivity Disorder is a condition that affects between 1 and 3 per cent of children and adolescents. People with ADHD have a great deal of difficulty sustaining attention, controlling their impulses and keeping still. These core symptoms can have a profound effect on behaviour, emotions, relationships and learning. Following a diagnosis of ADHD, young people, their families, and professionals working with them usually have a lot of questions to ask about the effects of ADHD and the various treatments available to them.